Confirming and/or configuring the roles and org units is necessary to ensure they comply with standard IMS context types. 1. Click on the Tools icon. 2. 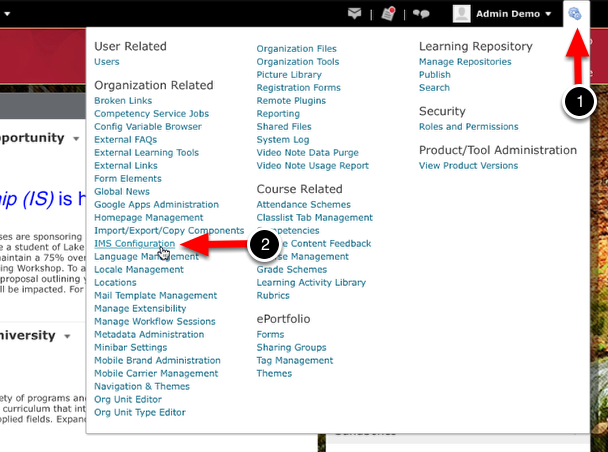 Select IMS Configuration from the resulting drop-down window. 3. Ensure that the Roles tab is selected. 4. Review and/or adjust the permissions for each user type. 6. Click on the Org Unit Types tab. 7. Review and/or adjust the permissions for each org unit type.